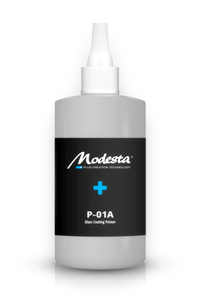 Modesta P-01A is a primer for Modesta\'s glass coatings that can also be used as a finishing polish. Its thick bi-layered membrane works together with the glass coatings to produce a deep gloss, shine and reflections from the paint surface. Glass coatings can be difficult to apply to a car\'s paint in thick layers. P-01A makes this easier. It also acts in a similar manner as a crosslinker, that promotes the coatings adherence to the paint itself, thus prolonging the durability and protection effects. The application of hardening-type glass coatings over an alkyd resin primer is a highly advanced technique used by professionals all over Japan. Modesta P-01A is a special resin similar to one of the components of automotive paints, that forms an up to 10μm thick layer. It can fill and hide minor surface inperfections without the use of abrasives. It can be applied to produce an flawless finish with minimal cutting needs during the preparation process. The primer is free of cheap oils, fillers and glazes that might last only until the next car wash, and can also be used to remove holograms.